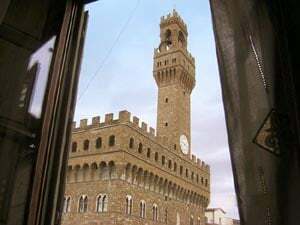 If you`d like to stay in the heart of Florence in its most famous piazza, Piazza della Signoria - the political and civil heart of the city since medieval times, and considered one of the most beautiful piazzas in the world: well, this enchanting apartment gives you this exceptional opportunity. It is situated in an old 14th century palazzo, and the windows of the living-room look right onto the piazza. The view here of the city, renowed for its artistic and architectural treasures, and considered a sort of open-air museum, is quite extraordinary. From the quiet of the apartment you can admire at any time the 13th century Palazzo Vecchio, with its imposing original structure and its medieval fortified characteristics, along with the tower, La Torre di Arnolfo, 95 metres high, which at dusk takes on a soft gold colour; then there is the Loggia dei Lanzi, with its harmonious arches and its spectacular `statue gallery` from the medici collection; the elegant architecture of the Uffizi, the greatest art gallery in Italy; the 16th century Neptune fountain by Ammannati, which the florentines called `Il Biancone` - `the big white one`; and the many statues that adorn the piazza, such as the copy of the famous David by Michelangelo, and the statue of Cosimo the First on a horse by Giambologna. It`s rather like a seat in the front row of a superb art gallery in this unique city. The apartment is full of light, furnished with care and taste and is very comfortable: it is equipped with air-conditioning, Internet connection WiFi, mosquito netting, satellite-TV, washing-machine, dishwasher, microwave, american coffee machine, hair-dryer and a bath-robe per person. Virtually the whole of the old city centre is a pedestrian zone, with very limited access for cars: not far from the piazza are some private pay garages, where you could leave your car. The centre of the city is well-served by public transport: close by are several bus stops and taxi-ranks and the railway station is just 15 minutes away. Everything is just a short walk from the apartment: including the most famous boutiques, the bars, the cake-shops and the many central restaurants. FIFTH FLOOR (with lift): entrance, double living-room opening onto the dining area, kitchen, 1 double bedroom, 1 twin bedroom, 1 bathroom with shower, 1 bathroom with bath-tub. Other services included in the price: Air conditioning. Wi-Fi internet connection.